Welcome to the Mitsubishi Digital Electronics America Online Store! 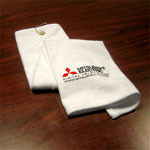 We, Best Promotions Inc., offer an array of custom-branded merchandise for you to choose from. Whether it's apparel, golf balls, gift items or caps, you can now order it all through our convenient and secure online store. Shop Online today! FOR PERSONALIZATION OR TO ADD A LOGO TO MITSUBISHI MERCHANDISE, PLEASE CONTACT AMBER SANDS 818-788-1178 FOR SPECIAL AUTHORIZATION. MINIMUM QUANTITY REQUIRED.